"The dwarf chiefs prohibited fairies from contacting humans directly. Therefore, they put on cloaks to make themselves invisible when they visit human towns. However, some naughty ones and some careless ones were discovered by humans from time to time. Dwarfs who love giving presents sometimes offered tools to human friends. The mysterious power of the tools began to be recognized as magic as none of the humans could understood the gadgets. Humans thought fairies had magical powers. Eventually, some of them began to catch fairies to employ their magic. Also humans began to fight each other seeking magical powers and the magical powers were used in battles. "Why have they gotten like this?" "Reason and intelligence take a long time to mature." "It is estimated to take about ten thousand years, if they do not become extinct." The chiefs laid down strict rules that fairies must not visit the human world nor contact humans at all. Before long, humans began to study science and expanded their world. The fairies and the magic were buried in their memories and became legends. Though the gate between the two worlds was hidden through very sophisticated tricks, sometimes humans strayed into the fairy world. Things they saw and heard there were taken as fairy tales or miracles. Humans came to believe in science rather than magic. It was good for both humans and fairies. All the efforts of greedy people to get easy fortunes with magic had failed. However, it seemed such luck would not continue forever considering the remarkable progress of technology. A breakthrough would cause big trouble if it occurred before the humans ? reason and intelligence sufficiently matured. The chiefs visited the Tower and told of their concern to Golem. Golem took them to the central part of the Tower. It read their minds immediately and replied to their minds directly. It was a plan to solve the problem and the Tower told them that it left the decision to the judgment of the chiefs. 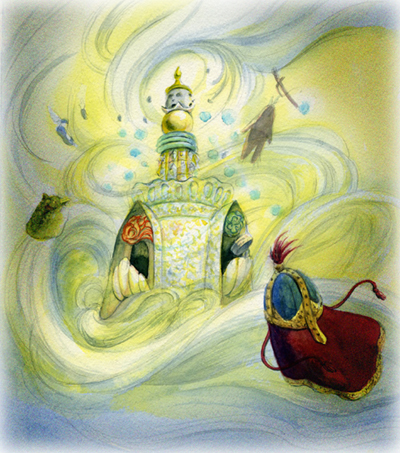 The Tower retrieved all the magical devices from the human world and stored them in itself instead of proceeding with the plan. Then it taught the chiefs how to control Golem and shut itself down. The gate between the two worlds was closed. However, some fairies dare to visit the human world once in a long while. The fact that they disappear so quickly without leaving any message is evidence that human civilization has not matured yet.